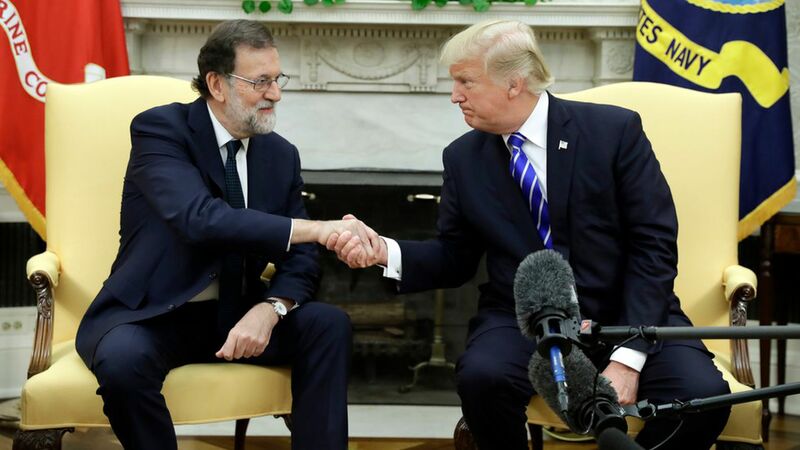 President Trump and Spanish President Mariano Rajoy shook hands ahead of their bilateral Oval Office meeting today. Trump praised Rajoy and his leadership, and Rajoy said he plans to discuss trade, economic growth, the NATO alliance and the fight against terrorism with Trump, per White House pool reports. Trump did not respond to reporters' shouted questions about Dallas Cowboys owner Jerry Jones and the NFL protests, but said the two leaders will take questions at their joint press conference later this afternoon. Editor's Note: This post was corrected to note that Rajoy is the prime minister, not the president, of Spain.